John Kevin Jones in A Christmas Carol. Photo by Joey Stocks. BOTTOM LINE: Dickens would have been proud of this passionate, stripped-down, one-of-a-kind feat of metatheatrical storytelling. New York is a city of unique experiences. To sustain a population of eight million, there needs must be a variety of singular performances, events, gatherings and happenings to delight and inspire. One such both delightful and inspiring performance is taking place now through December 24th at the Merchant’s House Museum near Astor Place, in the form of Summoners Ensemble’s annual production of A Christmas Carol. 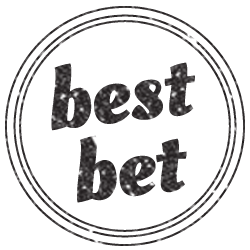 Now in its third year (last year’s review can be found here), this take on the classic tale is unlike any other. Something approximating this power is on display in John Kevin Jones’ portrayal of Dickens the actor at The Merchant’s House. 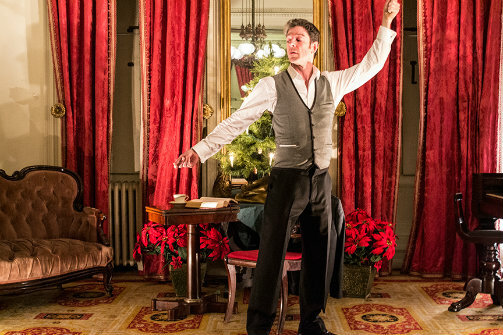 Jones’ performance takes place in the 1832 house’s upstairs parlor, complete with fireplace, piano, and lighted Christmas tree. The setting is intimate—there is a strict limit of 40 people per performance, and the night I attended it was packed to the Greek Revival rafters. Soft Christmas music plays as a representative from the museum introduces the piece and Mr. Dickens, whom he jokes bears a striking resemblance to actor John Kevin Jones. Right on cue, Jones strides up the center aisle and takes his place at the front of the room, in front of a small table and chair. Dressed in 1800s finery, Jones wastes no time with conceits or introductions, he simply assumes the character of the legendary scribe by starting right in with the story. “Marley was dead, to begin with….” The moment that iconic first line coolly emanates from Jones’ lips, there is a palpable sense of calm. It is immediately clear that Summoners Ensemble has found a capable, captivating performer in Mr. Jones, who in his third year with the piece has it down cold. With his commanding voice and adroit cadence, Jones’ Dickens plays like a live-action audiobook by Jim Dale or Jeremy Irons. He navigates with facility the changes between characters and moments, finding humor and pathos in the complex prose. All the while, his storytelling is wonderfully economical—a cupped hand indicates a child’s speech while a raised one suggests a ghost’s robes. The story of A Christmas Carol is no doubt familiar to us all; with the exception of Santa Claus, no one character has become so synonymous with Christmas as old Ebenezer Scrooge. His benevolent transformation at the hands of his nephew, his clerk, and four helpful spirits has served as a reminder for generations to keep Christmas in their hearts. This wonderful and surprising production of Scrooge’s story will no doubt serve as a similar reminder to all those in attendance. Thanks to his passion for language and feel for rhythm, Jones-as-Dickens proves the perfect narrator to the perfect Christmas story, encouraging the audience to lean in and to see this tale in a whole new light. I’m not sure what I expected when I stepped into The Merchant’s House for the show, perhaps another in a long line of inauthentic, saccharine, candy-coated versions of Dickens’ work that would have made the author cringe. Instead, what I got was a sincere, stripped-down, wholly interesting and wholly innovative approach to the text that left me feeling the right kind of warm and fuzzy. Kudos to Jones, to director Rhonda Dodd, and to Summoners Ensemble for creating a unique and enchanting addition to New York’s holiday calendar. Though the remaining performances are sold out, I would start making plans to stop by The Merchant’s House next December. It’s a shame that this unique experience, like Christmas, comes just once a year. A Christmas Carol is adapted by John Kevin Jones and Rhonda Dodd from the story by Charles Dickens, and directed by Rhonda Dodd. It is produced by Summoners Ensemble and The Merchant’s House Museum. Set and lighting design by The Merchant’s House Museum, costume design by The Merchant’s House Museum and Summoners Ensemble, and sound design by Holly Ruth Gale and Carol Denton.